Annie’s Resource Attic » Blog Archive » Treasure Hunt! Cover Page Of Treasure Hunt! Treasure Hunt! is a classic yarn, from the opening scene in which you arrive at a desert island to the moment the treasure chest opens and an improbable flood of loot bursts out. It’s a highly interactive story, with lots to do and plenty of sound effects to make the reader an explorer rather than a spectator. Almost immediately, you find a bottle with a note in it buried in the beach. The note turns out to be a real pirate’s treasure map, with the clues you must find. It’s a sort of scavenger hunt that eventually leads to the treasure. Thick jungle makes it a challenge to find the items on the map, even with a handy path to follow. Many clues require a student to pick from four choices. These puzzles add a bit of brain exercise to the adventure, but are in no way a test with correct and incorrect answers. Which Shell Is Like A Star? Some of the wrong answers are very entertaining, so encourage students to try all the choices. For example, students can easily match the red starfish to the star on the map, but it’s fun to hear the bubbly voices of the three shells that are the other choices. Later you can hear from three birds besides the toucan you’re looking for, and later still there are talking tiki carvings. Besides the map, there are other items you must find and take along for later uses. These include routine tasks such as scaring off a gorilla. Here is another point where you want to try all four choices, because this gorilla has definite opinions about which of the four objects he would rather receive. He sounds particularly dubious when you ponder throwing that pirate’s scimitar at him! Being a sensible ape, he would rather carry off the bananas. Some clues, like the crude crank mounted on a tree trunk, challenge the reader’s powers of observation. I tried to vary the clues as much as possible, one being a shape match, one requiring choosing from four objects similar in shape but different colors, and so on. There are scary parts to the cave as well. You’re almost at the end of the story when you are faced with choosing from four tunnels. 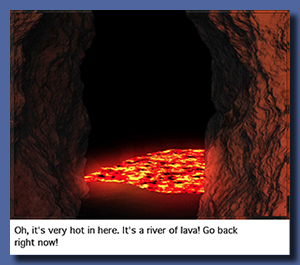 The three wrong tunnels lead to a gorilla, a monster, and a river of lava. These side trips are only one page each, and it would be a shame to miss them and their sound effects. The fourth tunnel leads to the door to the treasure room. The rest of the story is one long animation, so I put the finale into a separate file linked to that door. Very important: Be sure you start with the file named A Treasure Hunt, and let the finale open automatically when it’s time. After all the work the explorers must do, I went overboard on the treasure animation! This adventure will last many days, and students need a way to get back to where they left off. I’ve included a way to mark your place, stop for the day, and later return to the last view of the treasure map before that point. Students might repeat a few pages, but that’s a good way to get back into the story. A copy of the map is part of the Teacher Materials, in case someone wants to print it out and mark progress off-computer. You’ll still want to mark the place within the story to quickly get back to where a student stopped. Also included in Teacher’s Materials are the vocabulary words, story script, review questions, and detailed notes on Treasure Hunt! and on using the You Are Here option. The vocabulary level is about second grade, but the story line would be fun for younger or older students, grade six and even older. I didn’t put a vocabulary toolbar into the story, not wanting to break up the story momentum. For younger students, being able to have the page read aloud should carry them over words they may not know how to read. Students will have lots to say about Treasure Hunt, so I made two writing activities, Treasure Hunt Journal and the guided Treasure Hunt Review. Because it has questions and images from the entire story, the Review should be used after a student finishes the story. You could use the Journal along with the story, perhaps writing after each session, or write the entire Journal after finishing. Students understand many more words than they can spell, so there is a vocabulary toolbar included in these two writing activities that can insert any word from the vocabulary list. Custom IntelliKeys® overlays are attached, and there are Dynavox® package versions of all three overlays to run the activities from Dynavox AAC devices. See the Special Needs Access section on the System Reqs page for information on controlling the Classroom Suite version activities from PRC devices. I’ve also included overlays to print, ready to use on top of the IntelliKeys to set up an attractive interface. My hope is that this story will be a special treat for students who otherwise couldn’t hike through a jungle. 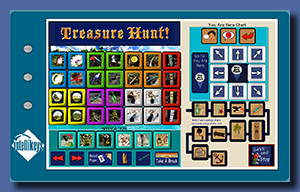 Whether you navigate with a mouse, a switch, or an alternative keyboard, Treasure Hunt! is full of surprises and smiles. Bonus: Puzzles, Clip Art, And Frame Animations! 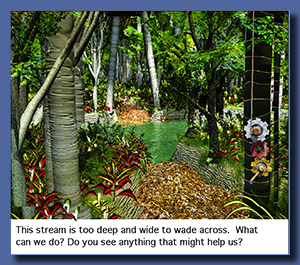 Look for links to two online puzzles, one with the seashells scene and one with the bridge over the stream in the jungle. Reserve those until a student has finished the story, to avoid spoilers. Online puzzles now work in all browsers, including those on mobile devices! I’ve given you a clip art collection that includes all the things that fly out of the treasure chest in GIF format. One file includes all the gems and smaller coins, in case you need to decorate something fancy or assemble your own treasure hoard. The other 53 files are individual images. Also experiment with a set of frame animations from the story, including the gorilla, toucan, and starfish. Easy instructions show you how to import them into Classroom Suite. Use these animations to make more activities, maybe entirely new stories or perhaps a sequel! Applications needed: Acrobat Reader, IntelliTools Classroom Suite. Seashells On The Beach link: CLICK HERE. Seashells 12-piece online puzzle. 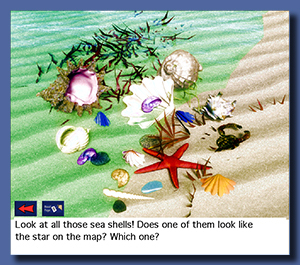 Image is seashells including the starfish from Treasure Hunt!. Bridge In The Jungle link: CLICK HERE. Bridge In The Jungle 12-piece online puzzle. Image is the bridge over the jungle stream from Treasure Hunt!. 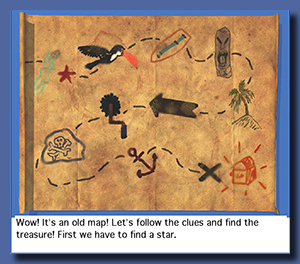 Teacher Materials.zip (1.7MB) Includes Teacher’s Notes on installing and using Treasure Hunt with students, the script of the Treasure Hunt story, questions included in the Review writing exercise, vocabulary list, Credits PDF, and, naturally, a copy of the treasure map to print. Credits also includes a description of how the imaginary desert island and all its contents were created. TreasureHuntOverlaysToPrint.zip (4.4 MB) Printable pictures of the overlays for Treasure Hunt and Finale, Treasure Hunt Review, and Treasure Hunt Journal. For Classroom Suite v.3 or later. Custom IntelliKeys overlay is sent electronically when the activity opens, and these printed pictures should be used on top of the IntelliKeys. 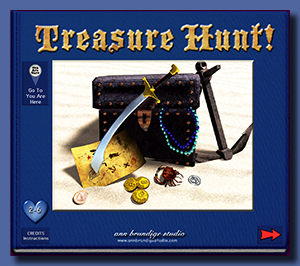 TreasureHuntComplete.zip (143 MB) A Treasure Hunt interactive book, Treasure Hunt Review writing/comprehension activity, and Treasure Hunt Journal writing activity in Classroom Suite v.3 or later. Custom IntelliKeys overlay is attached to each activity. treasureHuntDynavox.zip (3.3 MB) Treasure Hunt overlays saved as Dynavox package files for the story, review, and journal activities. TreasureGIFSCollection.zip (2.6 MB) A collection of 54 gif files with the items that make up the treasure in the Treasure Hunt story. To preview the collection, click here. 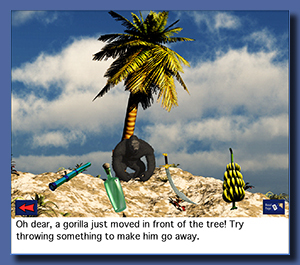 Treasure Hunt Animations.zip (998 KB) Frame animations from Treasure Hunt, including the gorilla, flying toucan, and dancing starfish. 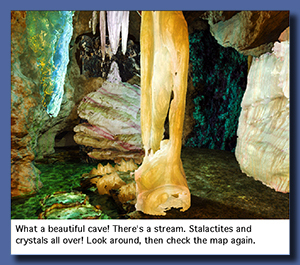 Animations are supplied in an IntelliTools Classroom Suite toolbar. File includes instructions on how to add these frame animations to your activities and how to save the toolbar to your User Library in Classroom Suite. Requires Classroom Suite v.3 or later.